This page is part of private German site and not commercial. The English pages are dedicated to AMANI a Tansanian home for children. 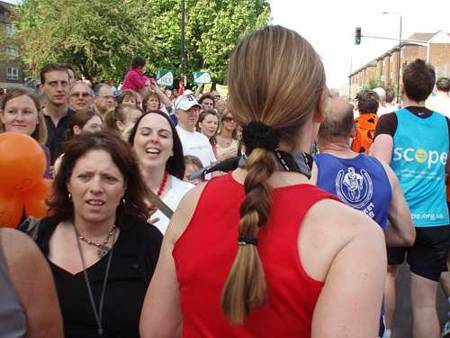 Please consider sponsoring my London Marathon 2007. 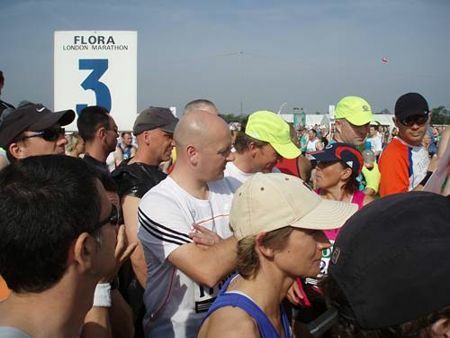 36.369 runners are waiting at 3 starting lines in the East of London. 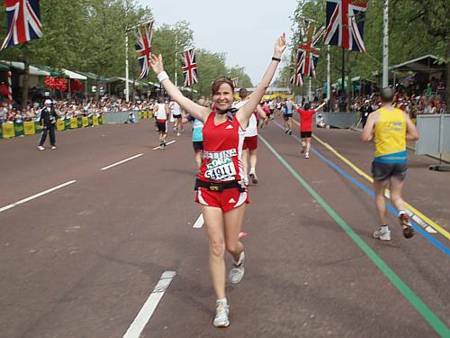 Until 6.45 pm, after 9 hours, 35.680 of them will have arrived at the finish in front of Buckingham Palace. 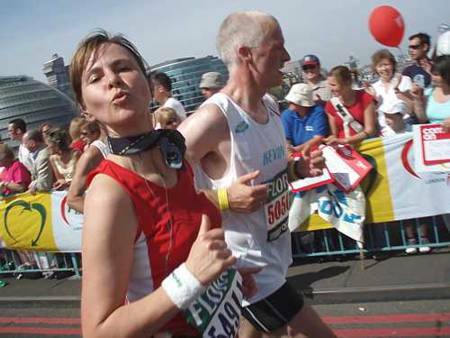 They make the 27th London-Marathon become the biggest of its history. 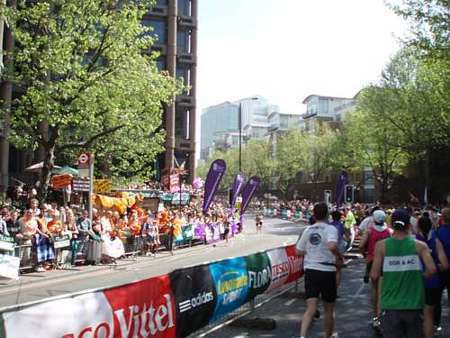 Almost 600 runners had to give up, thereof 73, who ended up in a London hospital! 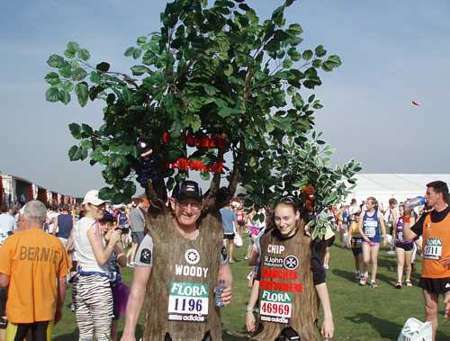 Lloyd Moreton (50) and daughter Jenny (18) are running for St John Ambulance as a pair of trees. 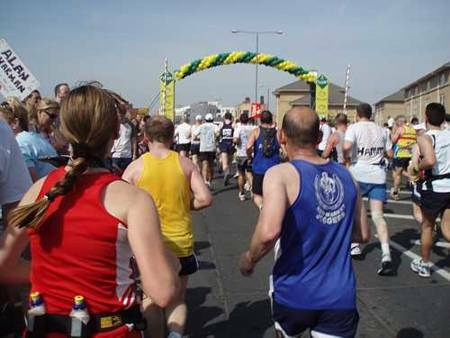 193 runners are collecting money for this charity, which also cares for the medical service at the Londn Marathon. 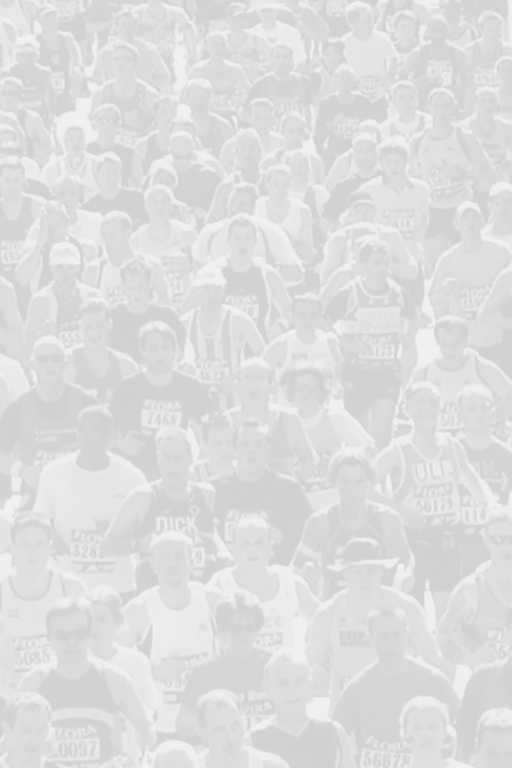 70% of all runners do it for one of the countless charities and generate donations of more than 30 mio pound. What proved of value in New York, cannot be useless in London. However, the time until the gun shot is shorter in Blackheath: Shortly after 8 am our bus arrives at the start area, the start is already at 9.45 am. 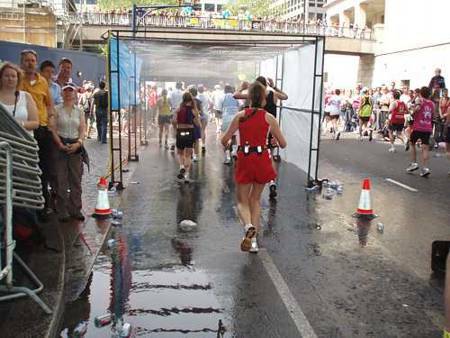 Our blue start with pen 3 is for runners aiming for 3:30 to 3:59 hours and it is jam-packed. At the red start this is much more relaxed. 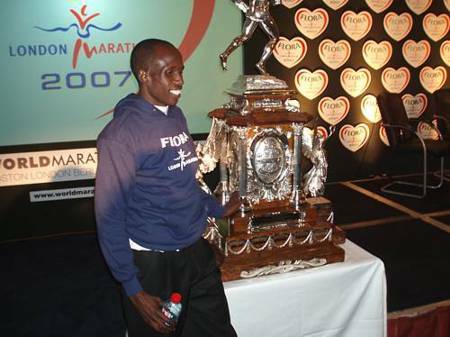 The overseas runners' 2007 move from the red to the blue start is no improvement. Indeed the route profile is easier but the road is much narrower, the field struggles to get going just to be stopped again at a bottleneck after 500 yards. We are delayed by one minute after the first mile and we don't manage to make up for it during the race. The crowds are big and cheerful also on the South bank of the river like in Woolwich, Greenwich and Bermondsey. The braid of Witten, Germany, is looking brand new after 10K. Hard to overlook are the big mile markers, which are equipped with big digital clocks at both sides of the road. Additionally there are markers every 5K and at half marathon point. 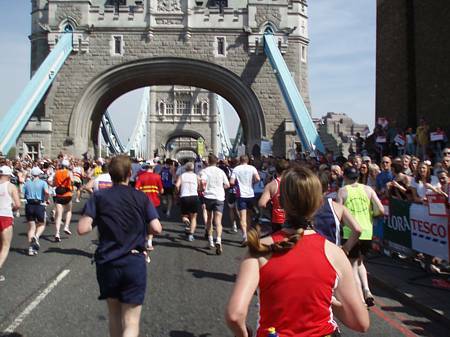 Tower Bridge is the emotional highlight of the event, exactly after 20 K.
Being in high spirits on Tower Bridge, one feels like giving the whole world a hug. Running is fun and keeps you young. If you need a proof - look at Bettina who is in her forties. Around half marathon point we can watch oncoming runners. The fast guys on the other side have a lead of 8 miles over us. So much the better to be on the other side yourself and watching back on those who yet have to circle the Isle of Dogs. However, I guess he didn't get it. The provided showers are very welcome today. 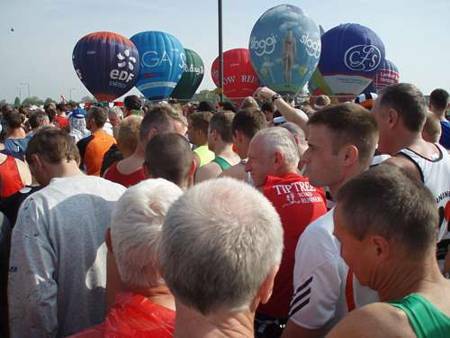 There are 28 service points offering 700,000 watter bottles and 200,000 Lucozade pouches. On The Mall a radiated heat of 27,5°c was measured. Usually the average finisher's time is 4:20 hrs, today it is 4:37 hrs. Along the final stretch in The Mall we thank the crowds for cheering us. 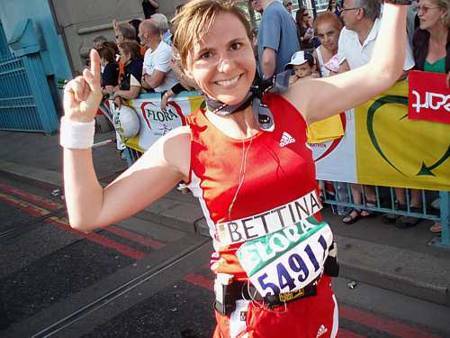 Bettina N. of W. in Germany is smiling in front of the finish of the biggest and hottest London Marathon ever. 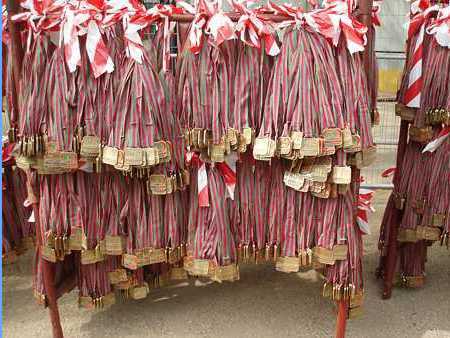 We can't be that slow - a good number of medals are still waiting to be received. 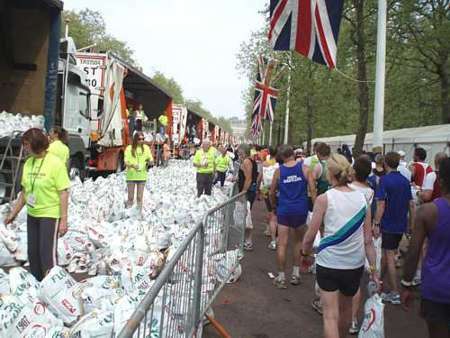 Nicely presented around 36,000 kitbags are lying ready to be picked up by the finishers. 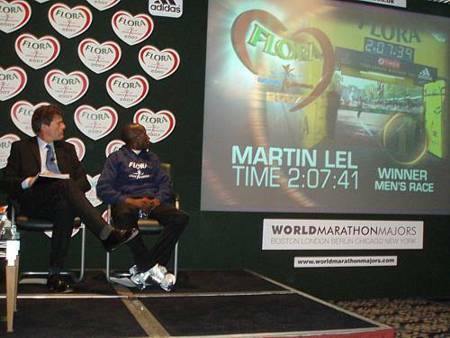 Martin Lel of Kenya is the dominating London runner of the recent three years - two wins and runner-up once! What is his secret? According to the contract Martin is carrying the sponsor's water bottle throughout the press conference. He must be happy that he has not to take home the cup. 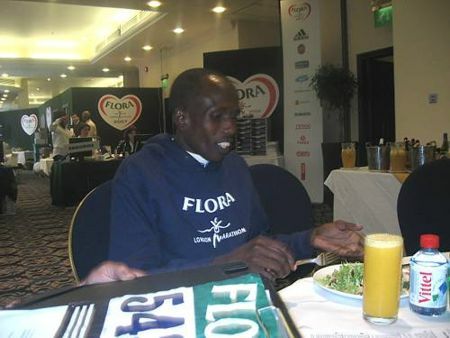 No alcohol, no sweets, and his main food - especially during race week - is UGALI, a Kenyan mush of sweet corn. here you find the recipe. at the foot of Mount Kilimanjaro. 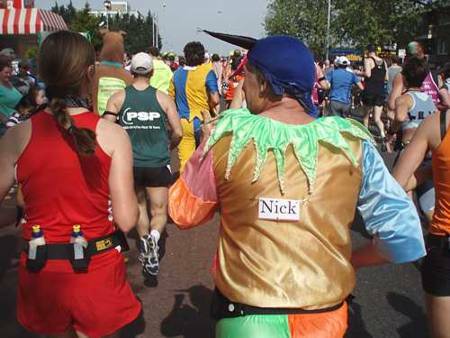 sponsoring my London Marathon 2007.